I pruned several of my hydrangeas today, cutting off old flowers and dead branches. This spring task is pretty time consuming because it’s not a job that can be hurried. 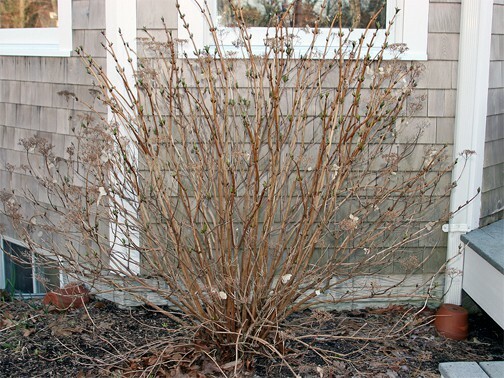 How big leaf hydrangeas are to be pruned, be they mop-head or lace-cap, is one of the frequent questions I answer on GardenLine. 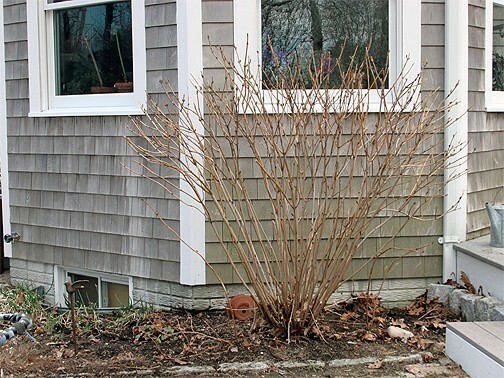 So frequent, in fact, that I posted an article about hydrangea pruning on GardenLady.com, along with a downloadable pdf of the information. Beyond the basic information of “first do this and next do that,” however, I’m interested in helping people to realize that there are gifts in this process. Today, in fact, I reminded myself of the same thing. Faced with so much that needs doing in this early-spring landscape, I want to rush through the tasks that need to be done. 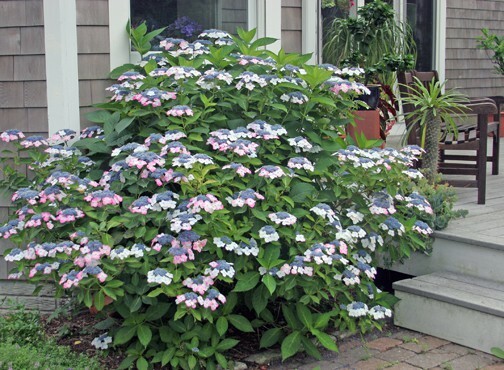 If the hydrangeas could get pruned quickly I might also apply fertilizer to selected shrubs and plant those Rhododendrons that we purchased last week. The hydrangeas are not sympathetic or cooperative with my desire for speed. Like it or not, I must proceed step by step, and accept that even after I think I’ve clipped every old flower and dead stem, that others will suddenly come into focus. I must also make decisions about those canes that aren’t really dead but aren’t thriving either. Some need to be removed even if they are still living, while others can be left to see if they will produce healthy growth after all. A few branches are crossed or weak looking, and these need to be cut out. And a couple of the stems are old and clearly not going to be produce many flowers. Some cuts are easy and others require the gardener’s best judgment. Once I surrender to this task it becomes a meditation. Because thoughtful pruning requires concentration, all other thoughts and experiences slip away. Instead of fighting this chore, once I yield to the cut-by-cut process, it is relaxing and soothing. There are many meditation traditions from Buddhism to yoga, prayer beads and beyond. I think that gardeners have long known another school of meditation: pruning. And here is how it looks afterwards. I've taken off the dead flowers, removed all dead canes, and trimmed off crossing, weak and odd branches. Notice that I haven't tried to make the shrub shorter than the windows....a futile task....give up on keeping them short. The less you take off, the more flowers you have. I love how this plant looks from late-June into September. If I cut it back to try and make it shorter, it would grow just as tall by July and that new growth would be all green.